They say the way to a man’s heart is through his stomach and I have to agree. My husband and I recently celebrated our 5th wedding anniversary and I suspect dishes like this one have made it seem like an easy accomplishment for him! 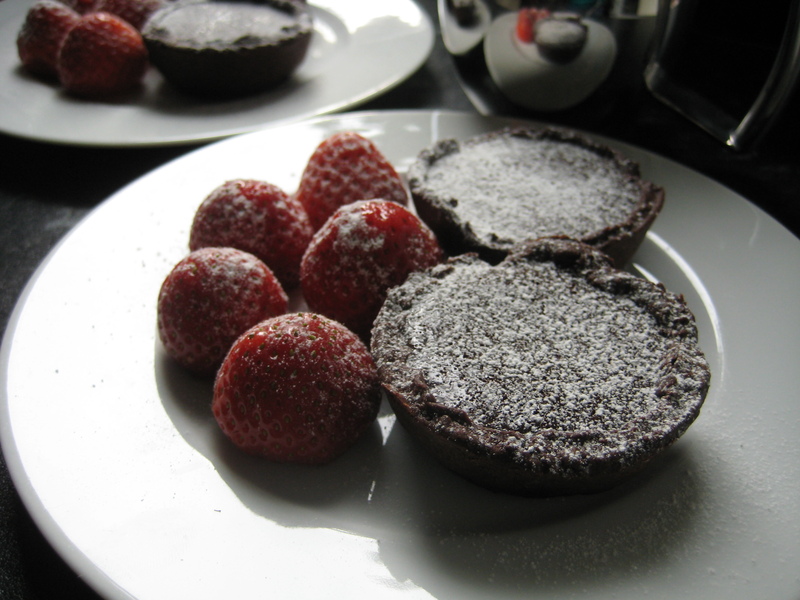 To celebrate we went to an open air theatre and took a fancy picnic; these tarts were part of the dessert I packed up. The weather and the actors were both fantastic but I wanted to make sure we had a good time even if it rained! *The custard recipe is stolen from Gordon Ramsay’s Just Desserts, a book I highly recommend! First make the pastry by rubbing the flour, cocoa powder, and salt into the butter. Stir in the sugar. Add the egg yolk and add the water a little at a time until the mixture comes together to make the pastry. Wrap in clingfilm and leave to rest in the fridge for at least 30mins. Roll out onto a floured surface and cut out circles to line your tin. 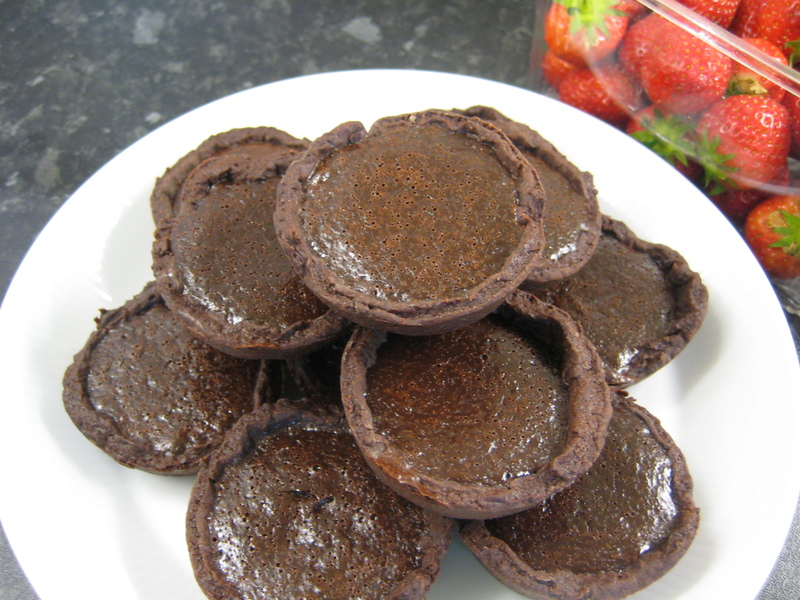 I used my muffin tin as don’t have any mini tart tins! Make sure you grease it first. Prick the bases and rest again for another 30mins. Meanwhile heat the oven to 180°C. Bake blind for 10-12mins (this is fiddly for multiple tarts, but the effort will be worth it). To make the custard, melt the chocolate over a bowl of boiling water. Bring the cream and milk to the boil in a pan and then add the cream and coffee to the chocolate and stir until smooth. Cool (so that when you add the egg it doesn’t scramble). Mix together the sugar and egg and add to the cream mixture and stir in well. Pour the chocolate into the pastry cases and (carefully) pop into the oven for 25-30mins until the custard looks set on top. cool on a wire rack. The custard should soften up slightly on cooling. I’m honest enough to admit there was no way I would have been able to have only one of these for dessert, but two was plenty! *collapses in fit of chocolate-induced longing/lust*. I HAVE to make these, but need an excuse so I don’t eat the lot myself! Is caster sugar what we call powdered or confectioner’s sugar? …and is double cream the same as heavy whipping cream? They sound delicious and would love to make! I’ve enjoyed looking through all your projects!